These Homemade Baked Crispy Beet Chips are a healthier and lower calorie alternative to potato chips and the fancy veggie chips available in your market, because these are not fried. These beet chips make a wonderful snack. Good for packing in a lunch, serving at parties or just nibbling on. These are chips you can feel good about eating! Preheat oven to 350 degrees, with racks in upper and lower thirds. Peel beets and slice 1/16 inch thick with either a mandoline or knife. In a large bowl, toss beets with olive oil. Beets should be thinly coated with the oil. On two rimmed baking sheets, arrange beets in a single layer. Sprinkle with a small amount of sea salt. Bake until edges of beets begin to dry out, about 20 minutes. Rotate sheets and bake an additional 10 to 20 minutes, removing chips as they become lightened and pale in color. Note: Most of the chips needed the full extra 20 minutes of baking time. Transfer to a wire rack; chips will crisp up as they cool. These are amazing! I'm featuring this week on AFW. 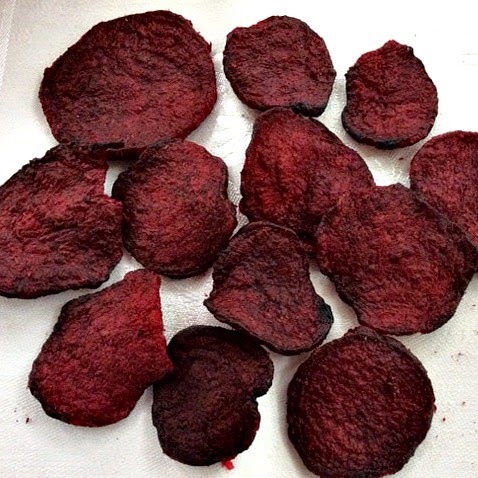 I've tried to make beet chips before, but they didn't really turn out. You've inspired me to try again!!! Thank you! !